Precious Metals Sentiment Hasn’t Been This Bad Since 2001, Get Ready For A Turn Like February 2016 | Energy and Gold Ltd.
It’s clear that the gold miners reached a “momentum low” in mid-August and the lower low put in place in September occurred on much lighter volume and much less selling pressure. 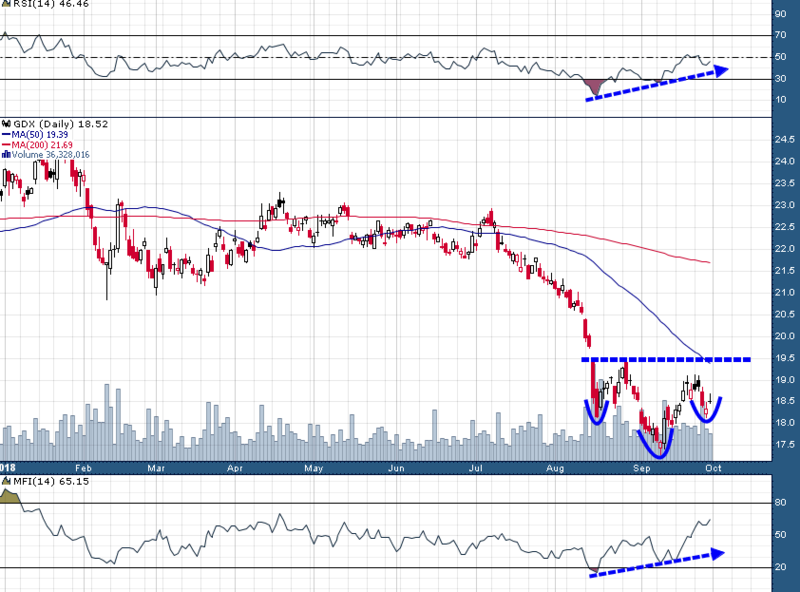 This marginal lower low at $17.28 on September 11th also took place amid several striking momentum divergences as evidenced by the RSI and MFI in the chart above. While this H&S bottom pattern is not fully formed and executed (right shoulder still being formed and breakout above neckline ~$19.50 has not triggered), the symmetry and volume profile of this pattern are quite healthy and indicative of a chart pattern that will offer a strong probability of reaching its target (~$21.50) once it triggers. 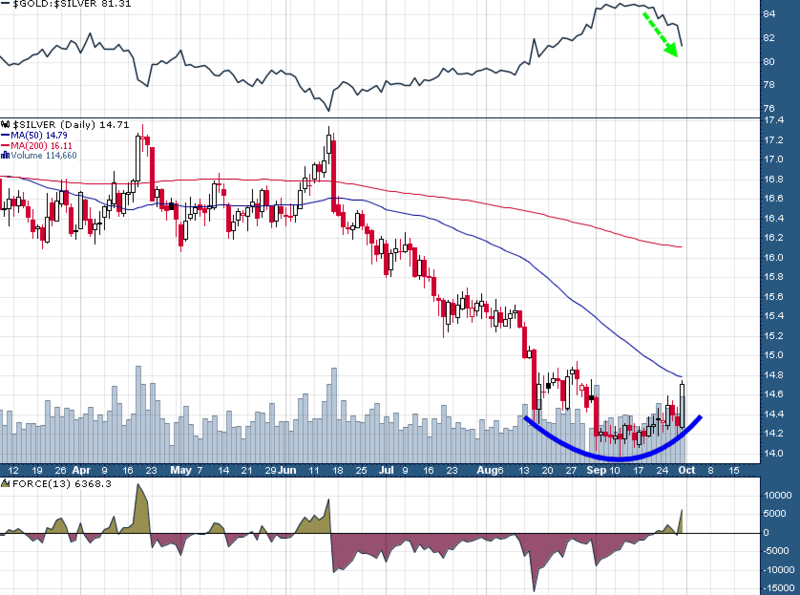 Friday’s strong rally in silver formed a large bullish engulfing candlestick which looks to have completed a rounding bottom pattern. The gold/silver ratio reached an historic extreme of nearly 86 in mid-September and since then silver has significantly outperformed gold which has brought the ratio down to 81.3 at Friday’s close. The last time the gold/silver ratio briefly rose above 85 was in February 2016 just as the precious metals sector was experiencing a tremendous turn higher out of a multi-year bear market. In many ways the backdrop today is very similar to January/February 2016 including extreme bearish sentiment; according to a survey by Bank of America/Merrill Lynch that was taken last week investors haven’t been as bearish on gold as they are today since 2001. Silver’s nearly 3% rally on Friday (far eclipsing gold’s .74% gain) stands out to me as the sort of strong move that occurs at the beginning of a rally. Moreover, precious metals bulls will want to see silver outperformance as a notable change of market character and evidence of a bull market (silver typically outperforms gold by 2-1 or more during the strongest bull market phases). 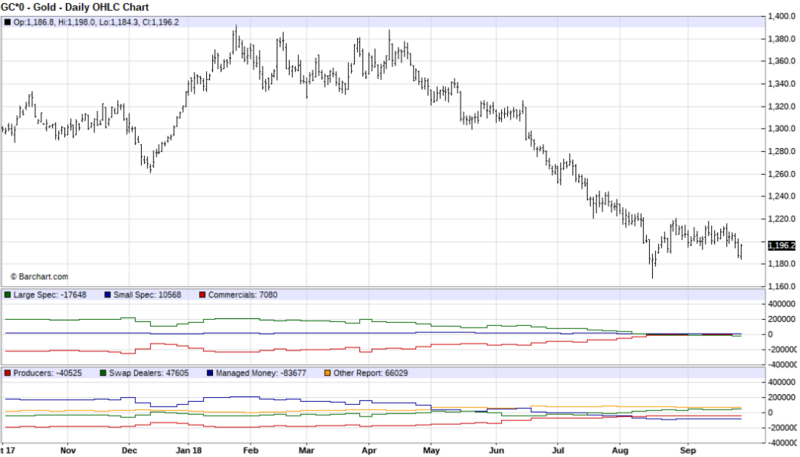 Since the August 16th low at $1167 in the December futures contract managed money traders have increased their net short position by an additional ~$50 million while the gold price is up roughly $30/ounce over the same time frame. Certainly it’s not a large increase in the managed money net short position. However, it’s the fact that managed money traders are not only not covering their shorts, but actually increasing them while price is moving higher that’s especially significant from my vantage point. And for my final bullish argument in this post, a quote from “commodity king” Dennis Gartman on Friday…. After a very rough 2018 I think much brighter days are just over the horizon for the precious metals and junior mining sectors. As always it will be important to manage risk by practicing appropriate position sizing – it is also critical to keep an open mind and not become too attached to one specific scenario. Strong opinions weakly held. If you’d like to get daily market analysis and trade setups from me, as well as learn exactly how I am playing precious metals and individual mining and junior mining shares you can subscribe to my Trading Lab. I have a couple of spots still open in the Lab for those who are interested in taking their trading to the next level while participating in an insightful daily dialogue with market pros and other active traders and astute market participants. If you missed it check out my Golden Dozen Rules For Trading Junior Miners!